Every food lover's ultimate dream is to tour the countryside of France, stopping off at luxurious inns with world-class restaurants and sampling fresh produce from local markets. Imagine having as your guide a savvy bon vivant, someone who lives for the pleasures of the table and knows just where to ferret out all the delicacies in each town. This book delivers just that. Each chapter covers a different region, from Normandy to Provence, and includes recommendations for a handful of the area's most excellent, off-the-beaten-path restaurants, along with recipes. The more than seventy-five recipes sprinkled throughout exemplify contemporary riffs on quintessential regional specialties. 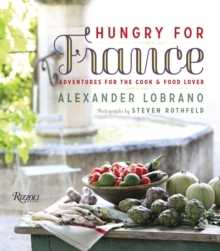 Hungry for France will inspire you to transform your cooking at home as well as to plan the trip of a lifetime.